My eldest daughter Rebecca (1 year away from completing her studies as a Registered Nurse) asked me to join her for a weeklong trip to Guatemala to the remote mountain region of Tactic, Guatemala, where she spent 2 and a half months volunteering in a medical clinic last year. I’ll be honest; it wasn’t on the top of my list. But those with daughters understand the power of influence a young woman can wield over her dad. 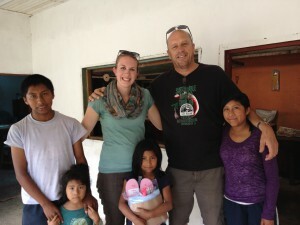 I committed to travel to Guatemala with Rebecca for the last week in June. Being a busy person, it would have been easy to justify canceling the trip, but I had committed, so on June 22 we were on our way. Rebecca was excited to reacquaint with the village that touched her heart last year and I left wondering what a Greenhouse farmer from North America could possibly learn in a third world country. After a 5 hour flight to Guatemala city we met with Les Peters of Impact Ministries, who along with his wife Rita have dedicated their lives to the people of the region. They gave up the comforts of Canadian life, to set-up schools in Tactic, of which they now have 5 at the elementary level and 1 high school with 1300 students. After a good night’s sleep we were off in a sprinter bus and another van to our destination with a group of students from Snohomish, Washington who would also make the trip to Tactic. The further into the mountains we ventured, the worse the road conditions became. This was made even more treacherous by laboring trucks traveling 10mph up the steep hills and descents. We were about half way to Tactic when the Sprinter began to act up. Les commented that there was too many red lights on the dash to be good – we needed to pull over. After checking under the hood, it became clear the serpentine belt had given up and broke in 2. So we loaded as many people as we could in the other Van and a few volunteers (myself included) stayed back to wait for a tow truck. Soon after the police stopped by to check us out and insisted they needed to protect us. Some 3 hours later the van that took the others returned to pick us up, but not before the police demanded payment for protection. We finally made it to the city in twice the time and were situated in a guesthouse rented by the mission for visitors. The accommodations were fine with the exception of a few basic necessities missing such as potable water. I was up early the next day thanks to a local birthday tradition of lighting off firecrackers at 4:30am and the daily noise of roosters, trucks and people. 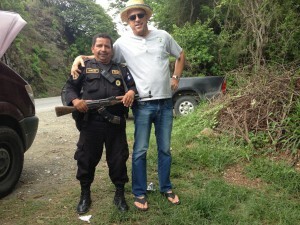 I was taken back as there are guns everywhere with guards protecting anything of value. Yet this is to be expected in a third world nation. I could handle that. However, what was to come as I was shown more of the country and its culture would change my life forever. On Sunday we attended a small church with a preacher exuding a vibrant, intensity not often seen in our North American churches. While I do not understand Spanish, his passion was clear. It was very special for Rebecca as her sponsor child recognized her during the service and ran to her arms, sitting on her lap for the entirety. That afternoon we went to Rio de Vida church, main church where Les and Rita pastor and were treated to the same intensity and passion as the morning service. Over the following days, I toured through the region with Les and Edgar (one of his first graduates who has since attended college for agriculture), to see how farming was done here. In addition to learning about the challenges of growing in the region, I was puzzled by some traditions that seem to get in the way of better crop results amidst a malnourished people. They are scared to change centuries’ old corn seed for fear of retribution from the corn god and their ancestors. In my time touring the country side, I also learned more about the incredible work of Impact Ministries and some of the challenges affecting the children of the region. Marriage is not a practiced custom and thus there are many without fathers, who do not attend school and are suffering from malnourishment and other social issues appalling to us used to North American comforts. Our 4th day in Tactic, I attended one of Impact’s schools and witnessed the power of education. The children were all in uniform singing their hearts out, happy and excited to be in school. This experience affected me the most. What could I do? I could go back home with an intact conscious and not find some way to make a lasting impact on these people. As the days progressed it became clearer to me. Most Mayans are malnourished, sustaining on only beans and corn tortillas. We need to find a way to bring more healthy fruits and vegetables into the daily diet of these children. Well there is going to be a lot more details in the coming weeks. The school nutrition program is going to consist of a Kubo built greenhouse and ensure the children within Impact Ministries schools are provided, fresh nutritious meals to accompany an education. This program is going to enrich the lives of many and I am already blown away by the response from many of those who read the newsletter. Stay tuned as we will be unveiling our fundraising goals in early November. This entry was posted in charity, Culture, Greenhouse Grown, Life, Sustainability, Tomatoes and tagged Craftsman's Care, Do your part, fundraise, Greenhouse, Growing, Life Lessons, Tomatoes. Bookmark the permalink. Both comments and trackbacks are currently closed.